Kidliterati: Kidliterati celebrates AT YOUR SERVICE and Jen Malone! Kidliterati celebrates AT YOUR SERVICE and Jen Malone! 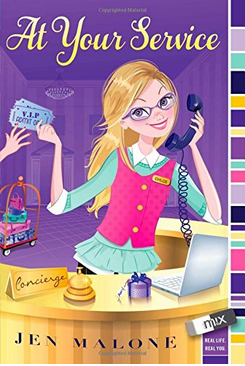 We at Kidliterati are so proud of Jen Malone for the release of her debut novel, AT YOUR SERVICE, and we want to celebrate! This is a very special occasion for us. Jen is the first Kidliterati contributor to release a novel. While we're thrilled that many of us will follow in Jen's footsteps, there's something very special about your first time. And, there's something very special about Jen. Jen is one of the most thoughtful, caring, and kind people you'll ever meet. She's also smart, upbeat, and a lot of fun. And so is AT YOUR SERVICE! "This wonderful book is perfect for tween girls that like "not-so-scary" stories, mysteries, adventures, and most importantly, princes. It is 262 pages of pure awesomeness!" "I am SO excited for Jen and the release of AT YOUR SERVICE. This book is so-very-Jen--full of humor and fun and, of course, a cute boy (who happens to be a prince!). Chloe is such a great character, and she takes us on a whirlwind tour of NYC as she searches for a lost princess. Congratulations, Jen!" "I thought it was really cool. I don't usually read realistic books, but Chloe as a working kids made it interesting. I would love to read more by this author." "Chloe has the life every girl hopes for and is the BFF we all wish we had." "I loved this book so much I begged my parents to keep reading at a really exciting part. But it was already past 10:00 pm, so they said no. I woke up in the middle of the night just so I could read the next part!" "AT YOUR SERVICE is everything that I love about middle grade -- a pitch-perfect voice, a fresh concept, and a rollicking adventure. And sure, the cute but oh-so-full-of-himself prince doesn't hurt either. But my favorite part was the fact that my 13-year-old daughter and I read it together. We talked about pressed pennies, boys, and first kisses. We talked about what it would be like to live in a hotel. And finally, we talked about how much fun it would be to race through NYC but eventually decided that it would be a little scary too. For me, that's the perfect metaphor for middle grade literature." "Alex and Chloe are my favorite characters. It was an awesome book and I would love to read it again." "Chloe's lists kept me laughing all the way through AT YOUR SERVICE, because A) she's got such a quick wit, B) her ideas are so original, and C) do we really need any more reasons to love her?" "Even though I've been to NYC before, I felt like I was getting a whole new tour by Chloe! It would be so awesome to live in a hotel and have sleepovers while room service brings hot fudge sundae bars. Chloe seemed like a real person to me, and someone I'd definitely love to be friends with." We can't wait to hear how much you love Jen's AT YOUR SERVICE! I love this book, especially the heroine's action-packed search for the little princess through so many of New York City’s iconic tourist spots. Very fun, witty, and memorable. Jen's a terrific writer (and now an author!) and a wonderful, generous member of the readers group.